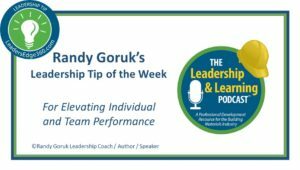 As you may know, to complement the Leadership Tip of the Week, we recently launched a podcast on leadership and learning. If you have downloaded or listened to any of the podcasts, thank you. Please let us know what you think. If you haven’t, here are some highlights from the first few podcasts so you can learn from proven leaders. Being an effective listener is an important skill for leaders to develop. Listening is not having a conversation in your head while the other person is talking. As a leader, you can’t lead anything if you don’t love what you do. When you love doing what you do, it ripples throughout the organization. Leaders have to overcome the temptation to do everything themselves. Becoming a good coach is important to your success. Benefit from the leadership messages coming through The Leadership and Learning Podcast by listening to these and future episodes on your favorite podcast platform. Weekly episodes are available on iTunes, Spotify, Sound Cloud, Google Play, and on the podcast page of our website. The interviews will provide you with nuggets to help you grow in your profession and improve your leadership effectiveness.